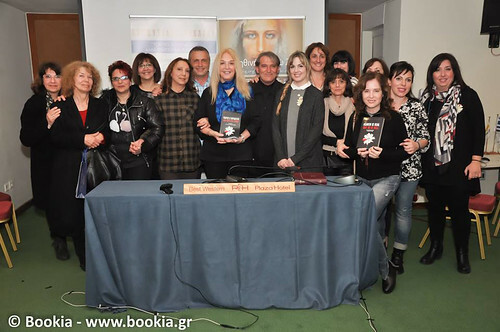 Following the successful presentation of the book Heaven Is Real but so is Hell at the Ianos Bookshop in Athens on March 7, 2018, another bookshop, Karavaki, this time in Rhodes, showed an interest in organizing a presentation of the book. It was a great blessing from Jesus for Rhodes, as Vassula lives there and we all know that many have levelled accusations and calumnies at her on issues of her personal life. Nonetheless, their calumnies and accusations were not aimed at the TLIG messages, as they can find no fault with them. 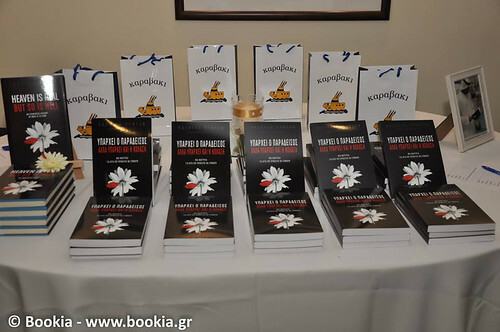 Eleftheria, the bookshop manager, cooperated with Emmanuella, Thanassis, Tassos, Andreas and the TLIG Rhodes group to organize this event. They found a hall to host the event at the Plaza Hotel and set the date for Saturday, March 31, 2018. Vassula herself would present her autobiography, answer questions, and sign books at the end of the event. Bearing this message which invigorated our minds and hearts, we very quickly prepared for the event in detail and prayed for the presentation’s success. Hence, we decided to invite the Social Network for Readers and Books (www.bookia.gr) for live coverage of the presentation and its promotion on the internet. The Bookia journalist interviewed Vassula, who replied to five main questions. Question 1: Vassula, the presentation of your book Heaven is Real but so is Hell has drawn a great deal of attention to your name and your mission all over the world. We know that this book was published in America, was a best seller on Barnes and Noble for two years and in the spirituality section on Amazon. You mentioned that for the past 30 years you have been travelling all over the world and you have delivered over 1124 speeches in 86 countries where you have been invited. So the following question arises: Where do the funds for your extensive travelling come from? Question 2: Do the people who come to listen to your speech pay for admission, even if it’s just a minimal sum? Question 3: As you mentioned, you have authored two books. The first one is entitled True Life in God and the second one is entitled Heaven is Real but so is Hell. The first book has been translated into 42 languages, and the second one into at least 10, with more translations in progress. One could claim that you are a very wealthy woman, even if you only receive royalties. Are you really a millionaire? Question 4: Vassula, you spoke about a vision you saw and heard from Our Lady and Jesus, which was the reason you opened the Houses of Our Lady, called Beth Myriam in the Aramaic language, where poor people all over the world are fed. Could you elaborate on how these 26 houses work, where they are, and what kind of services they provide? Answer: “Beth Myriam means House of Our Lady in Aramaic. They are houses run by volunteers. These volunteers have been touched by the messages of Our Lord and Our Lady and have volunteered to open a house in a poor area in order to help the poor. They cook daily, and some of the BMs also provide dental care from a volunteer doctor. They all provide one hot meal daily. Question 5: What is most important, where does the money to run these houses come from? 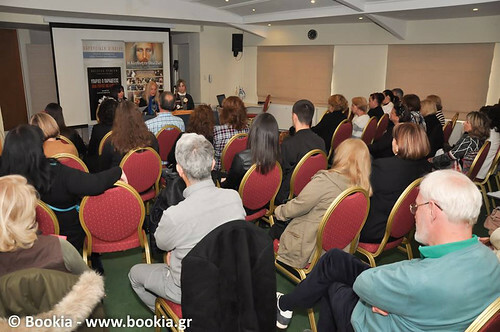 Following the Q & A session, that afternoon, Eleftheria, as the bookshop representative, welcomed Vassula and those present. Emmanuella introduced Vassula to the audience. Among other things, she mentioned that Mrs. Vassula Rydén is Greek, born in Egypt, and belongs to the Greek Orthodox Church. Her husband’s professional obligations meant that she had to spend more than 20 years in Africa and Asia. She passed her time with receptions, painting and tennis: a pleasant life, without any pressure. All of that was to change dramatically in November, 1985. She could have never imagined that God Himself would reveal Himself to her while she was living in Bangladesh with her family. This was the beginning of a mystical communication which continues to this day. God dictates and reveals to her words of wisdom. They are a reminder of His Word, the Holy Bible, and are meant for her to pass on to His people so that they know His love and His will. She wrote these words of wisdom in notebooks and they were subsequently published and translated into 42 languages, under the title of True Life in God. Mrs. Vassula Rydén’s autobiography, entitled Heaven is Real but so is Hell which we are presenting, is the story of Mrs. Rydén’s amazing journey and her conversations with God. It is a book which will awaken all those who seek a path towards the truth in the midst of today’s turbulent world. The book Heaven is Real but so is Hell was published in English in 2013 and remained in the #1 Best Seller for several months at Barnes & Noble, Amazon and USA Today, in the categories of “Orthodoxy” and “Religion” respectively. It has already circulated in 10 languages, while translations into additional languages are in progress. 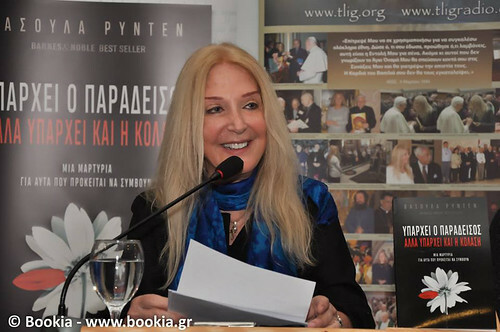 It has been recently published in Greek and we hope that it will be successfully known. Mrs. Rydén makes no profit from any publication. She does not even receive royalties from any books sold. She makes no profit whatsoever from them. As she says: “This is the work of Jesus and He gave it to me freely and freely I give it.” The royalties from books go to the Associations printing these books, not to Mrs. Rydén. Vassula stepped up to the podium last, saying that her Greek is not good and that she attended an English school; that is why Jesus speaks to her in the language she understands best. After thanking everyone present, she said that the book she was presenting on that day is her autobiography. She tells her story in it. It is not fictional but describes true and real events. She said that it describes not only Heaven but also Hell, and that is because the Lord wanted to show them to her through visions and in a supernatural way. She said that as Christians, we know that God can reveal Himself whenever He wants and to whomever He wants. God gives us signs that He exists through miracles, through dreams, or even by speaking to our heart. It is a divine gift to listen to Him in our heart. When the Lord speaks to our heart and gives us this gift without us deserving it, it is not for our benefit, but for the benefit of society. "It is this spiritual journey that I have tried to describe in the book. This year it is 33 years since this journey with Jesus began. I recognized for one more time the Voice calling me when I was a child. The difference is that the Voice is no longer only in my dreams, but also in my heart. "Ever since, Jesus has given me a lot of messages and visions, and prophecies, of which some have already been fulfilled. Others have not been fulfilled yet. He enabled me to see the souls that have not reached Heaven yet and need prayers and Masses. He enabled me to see His angels and His heavenly residence. He then showed me Hell and how much Satan hates us. Jesus said that there are many who do not believe that Hell and Satan exist; that is why He showed them to me, so that I can describe them in my book. Our Lady also gave me a lot of messages on our times, and a call to begin helping the poor and those in need. The Lord explained to me that our generation is experiencing a real spiritual battle which we all participate in. I describe this battle in my book. We are all in this battle, and it is not a physical battle but a spiritual one. We have to fight spiritual beings which affect us and try to hurt us. They contaminate our mind so that we make bad choices. What is prophecy? Does the book include prophecies that have been fulfilled? Is there a prophecy on our times? Since we have the Holy Bible, why does God speak in our times? In your mission all these years all over the world, has Jesus indicated His presence by working a miracle? When God calls you to write, how do you see Him? Are Heaven and Hell in this life after all? Why does God allow suffering and sorrow to afflict people? The question and answer session lasted about one hour and then almost everyone, about seventy people, bought the book, asked Vassula to sign it and to pose for a photograph with them. However, the evening was not over yet. People would not leave the hall, forming small circles and discussing all they had heard during the presentation. It was then that some of the people gave testimonies, saying that they saw Jesus on Vassula’s face. Michel, a student from Palestine studying in Chania, saw Jesus’ blue eyes instead of Vassula’s the entire time he was looking at her. And he was not the only one. 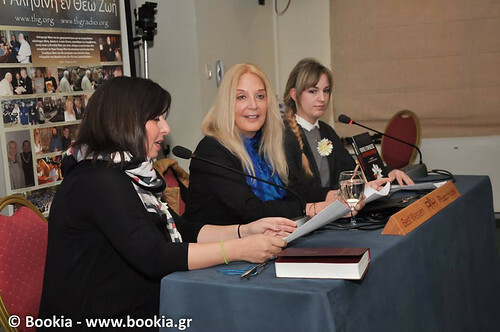 Mrs. Morfoula Gogidou as well as Mrs. Popi Xifaki, a Bookia contributor observed the same phenomenon. As a token, we quote Mrs. Maria Papavassiliou’s testimony: "The moment Vassula said, 'Now do not think that we are alone, Jesus is here,' I saw from where the wooden sign of the hotel on the presentation table was, down to the floor, Jesus' white garments, which were very brightly white; they were those from His waist down. Nonetheless, what impressed me were the ripples within His garment, spaced wide apart, while the flat fabric covering the table was blue. It was impressive; I focused my gaze on that, and I realized I was seeing Jesus' white tunic instead of the cloth covering the table. This setting was in front of the area where Vassula was sitting. In general, this incident was Jesus appearing to me one more time because I have asked Him to reveal Himself to me, and He has done it before. I have had other similar experiences." It was a really successful presentation, with a lot of blessings from Jesus for all of us. For ten of the people listening to Vassula talk about her mission for the first time, this experience did not end at the end of the evening. Three days later, at a friend’s house, Vassula was talking to them about His messages and her mission all over the world. She replied to their questions for three full hours. Praise God.